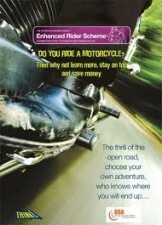 With fresh start motorcycle the ERS skills will initially be incorporated into the existing courses. The assessments for the ERS will be of two hour duration, and will include the rider debrief administration and discussion on any future training issues. (You can book just the two hours if you want) some do this learn and then come back for a full day to get the very best out of their new knowlage or better still to learn and practice. book the full day to start with for the very best in learning and haveing a tour out too. The ERS consists of eyesight and documentation check, so you need to bring your driving documents with you. After this, your riding will be assessed and a Rider’s Development Record, which consists of 26 competencies, will be completed and if you are successful in achieving the required standard a Rider Appraisal report will be issued. The Rider Appraisal form has 11 assessment categories and they are graded: Band a – Low risk to Band D – High risk. Only when your trainer is satisfied that you have demonstrated that you are capable of consistently riding, independently to the performance required in all the competencies. you will receive the Enhanced Rider Insurance Certificate. (The document needed to enable you to get agreed discount from the insurance companies who are supporting the scheme). In other words you’re riding being classed as LOW RISK. HOWEVER there are some competencies, which are theory based, as well as practical based and it would be wise to study an up to date Highway Code. Machine Checks, Braking Techniques, Separation Distance and Use of Speed, Pedestrian Crossings, Darkness, Weather Conditions and Road Surface, Legal Responsibilities, Environmental Issues, Parking and Security, Passengers and Carrying Loads, Incident Management, Group Riding and Touring and finally Overcoming Limitations.